For many immigrants, integrating into Canadian society poses challenges. Hamilton Artists Inc. on James Street North consistently works with artists of all nationalities but realized that integration could be smoother. “They were saying ‘We feel like we are not being heard. How do we get our voices out there [into the world]?’,” said Jasmine Mander, coordinator for Hamilton Artists Inc. The Incoming program was created in order to address these questions and feelings. Designed to connect new refugees and migrants to Hamilton’s art world, Incoming provides artists with a basic understanding of how the art world works, especially on a Canadian scale, as it differs so from other countries. The Incoming program started off with workshops that teach participants how to write biographies, artists statements and resumes. Hamilton Artist Inc. is also planning on hosting a meet and greet for new refugees and migrant artists as an opportunity to connect with one another and to other working artists. The main component of the Incoming program is an exhibition taking place in Hamilton Artists Inc.’s gallery space. All In One Place was curated through an open call that was posted within the community. “Outreach is difficult because we aren’t just posting in local galleries, we’re posting in places like working centers and providing translations, so it is accessible.” stated Mander. All In One Place is the culmination of four lifetimes’ worth of experiences represented in four vastly different styles of art. The exhibition features the works of four Hamilton-based artists: Jordi Alfaro who has created large sculptures that are thought provocative within the space; Cesar Correa Cordoba who uses natural materials to create realistic animal sculptures providing a dialogue between man’s relationship with nature; Salwa Issa who paints her investigation of water; and Bassem Alshamali who paints his depiction of the world through space and time. For Cordoba, his story began in Mexico City. He lived and travelled to different parts of the country as he loved to learn about the diversity that existed within traditional art throughout different regions of Mexico. “My inspiration is every root and ramification of nature. The traditional handcrafted arts of Mexico, diversity of plants and animals, the rivers, seas, forests, people… everything inspires me,” said Cordoba. The artist took to using materials he found all around him to create life-like sculptures of owls, hawks and other animals. “For this particular exhibition, I used nature as my inspiration. The sculptures with dry plants is to me something like a ritual and I feel connected with nature. I get to learn about plants, collect them and try to understand the shape of the universe,” explained Cordoba. Although Cordoba has only been in Canada for two years, he hopes that his work can share his Mexican heritage with the rest of Hamilton. “The most important thing to take away from this exhibition is to enjoy it and think about the connection of diversity, in all levels… ,” said Cordoba. Alshamali’s story began in Syria but he found himself fleeing to Jordan and Lebanon due to war. His final destination was immigrating to Canada. He was nearly done his PhD in Arts and Archeology in Lebanon before having to immigrate to Canada out of necessity in 2016. The artist’s work has evolved since his arrival here. He feels free to express his thoughts and opinions without fearing any repercussions. “I came from a place where the war has torn everything and most of the things that happened were for ideological conflicts! Being safe here taught me to be grateful and appreciate the little things as much as big ones. Through my experience, my story, my art I would like to emphasize that ‘love is wise, hatred is foolish’,” said Alshamali. “Each artwork has a technical and intellectual time for materializing the ideas into a physical form, though I would say it’s hard to put that implementation into a time frame. Especially since I am a sculptor and I see the painting from a different perspective, a sculptural perspective,” explained Alshamali. Hamilton Artists Inc. hopes that the Incoming program will be a sustainable way for migrants in Canada to be able to seamlessly integrate into the art community, so they do not have to go into cities such as Toronto and be overshadowed by others. 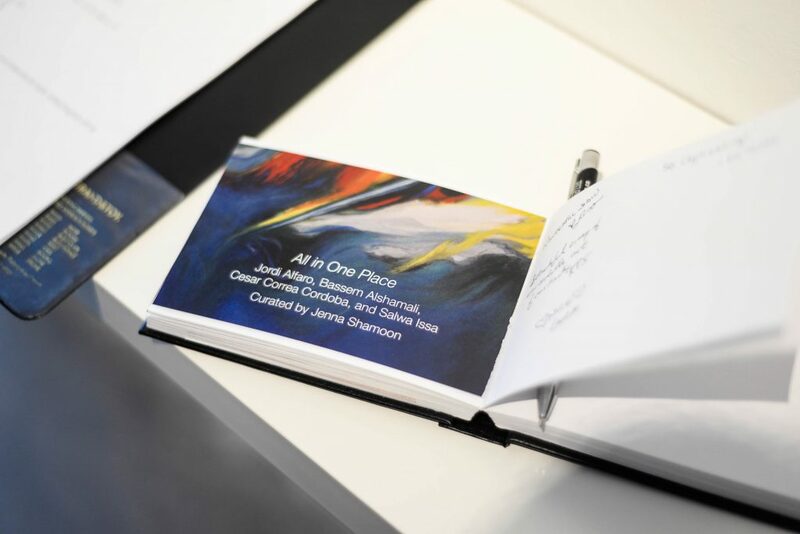 All in One Place will be on exhibition until March 9th at Hamilton Artists Inc. located at 155 James Street North.